Description: Designed especially for handling brick, concrete blocks, hollow tile, etc. Well balanced. Made of seasoned hardwood. Dash can be adjusted to slanted or right angle position. Hardwood high riser places load over wheel for better balance and easy wheeling. Wheelguard adds to rigidity. Bed 26 1/2 inches long, 24 inches wide. Dash 18 1/2 inches high. Approximate weight 61 pounds. Description: Press formed tray is narrow for easy passage through doorways. Preferred by many contractors due to straight sided construction and increased depth at the rear. Ideal for handling concrete. Description: Seamless trays deep drawn with rolled reinforced edge. Smooth hauling, fast dumping. Strudy. Ideal for handling concrete and for general construction purposes. Sides and bottom are formed from a single sheet of steel. Corners are lapped and electic welded with pressed steel reinforcement. Smooth bottom and sides, curved ends facilitate easy mixing of material. Description: Holds No. 1 mortar pan firmly in place at a convenient height. Provides easy access to mortar thus saving time and money. Sturdy construction. Folds for easy storage. Made of 16 gauge standard 1 in. steel tubing. Durable baked automotive finish. Opens to 22 1/4 in. span; height, 18 3/4 in. 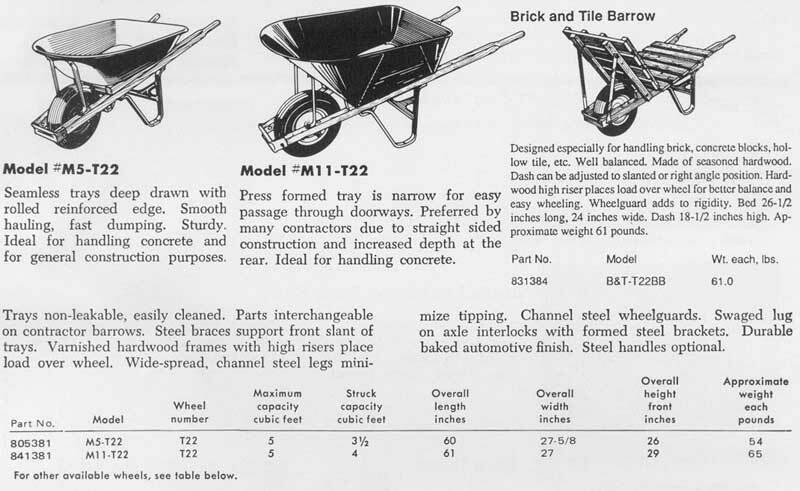 Overall height with No.1 Mortar pan, 22 in.